Need to keep the land around your rental properties looking fantastic for your tenants? Looking for ongoing services from skilled and reliable local gardeners? The landscaping specialists at Ricky Tyler Landscapes offer a thorough, professional service with fantastic, low rates; get in touch today and arrange a visit from our team! Whether you're a private landlord or a lettings agent, you'll know how important it is to keep your properties looking fantastic - inside and out. A great-looking garden area will attract new clients and give them a lovely home to live in. Keeping on top of grounds maintenance can be a tricky job though - that's why we're here to help. From grass cutting and hedge cutting to laying turf and garden landscaping, we can carry out any job, no matter what the size. Whether your communal gardens need a quick tidy-up or a complete makeover, we can create the effect you want and ensure that all jobs are tended to promptly by trained, skilled experts. We can also undertake tree work and hedge cutting, remove unsightly or hazardous tree stumps, fix paving and decking, and more. No task is too much trouble, and we're here when you need us. Arrange a garden clear-up ready for your new tenants, or get a regular visit on a monthly basis to keep your garden looking great all year round. 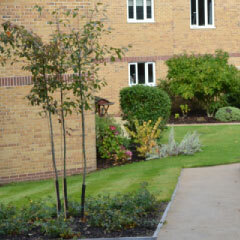 We can also provide grounds maintenance for schools, care homes, student accommodation and other residential buildings. 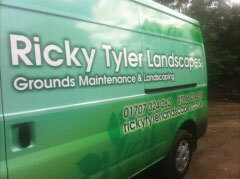 If you'd like to know more, or to arrange an appointment, please call Ricky Tyler Landscapes today. Ricky Tyler Landscapes can provide gardening and grounds maintenance services including Flats Grounds Maintenance covering London, Essex, Hertfordshire, Northampton, Buckinginghamshire & Bedfordshire .